Which people opened the emails. Which of those people clicked on the link(s) in the email and at what date and time. That’s useful – but not as useful as updating your version of A1WebStats so that you will recognise each visitor if they come back to your website in the future. Not their main work location (e.g. from at home). Work locations that can’t easily be identified by their IP address. This guide helps you to take all those who clicked through from your email campaign, identify them within your A1WebStats visitors data, and to edit your data so that you will easily recognise them when they come back in the future. Depending on which system you’re using to send out your email marketing, it may or may not appear in your A1WebStats data until you make adjustments. The way to check this is to select the date range after which you sent out your email campaign and then click on Referrers from the main navigation bar to then see if there is reference to your email campaign in the list of referrers, as you can see in the example below. 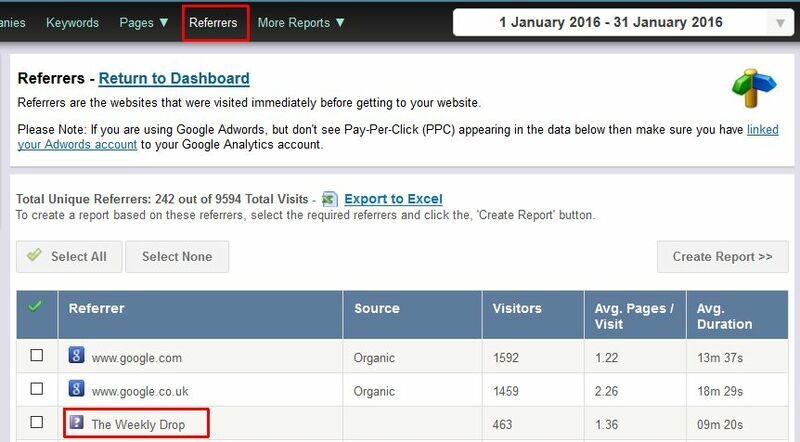 If you can see your email campaign in Referrers then you can jump to step 4. If you are not seeing your email campaign in Referrers, then you may need to add parameters to the links within your email campaign template. There are many ways to do this (your web developers are likely to be able to help) but one method would be to add a parameter such as ?utm_source=yourcampaignnamehere. So, if your email campaign contained a link going to your red-widgets page as www.yourdomain.com/red-widgets, then you would modify it so that it is www.yourdomain.com/red-widgets/?utm_source=redwidgetscampaign. Having set up your email campaign links so that they should be trackable, we recommend that you send a test campaign to then check that it gets picked up within Referrers. If you have any problems with this, please do contact us and we’ll be happy to help. Once you can identify clicks from your email campaigns within the A1WebStats data you are then in a position to update the records so that you can identify each visitor within your A1WebStats data. First you need to tick the box next to the email campaign, having identified it within the Referrers view, and then click on ‘Create Report’. You will now see every person who clicked through from that email campaign but what you’ll notice is that many of them do not have their company name showing. 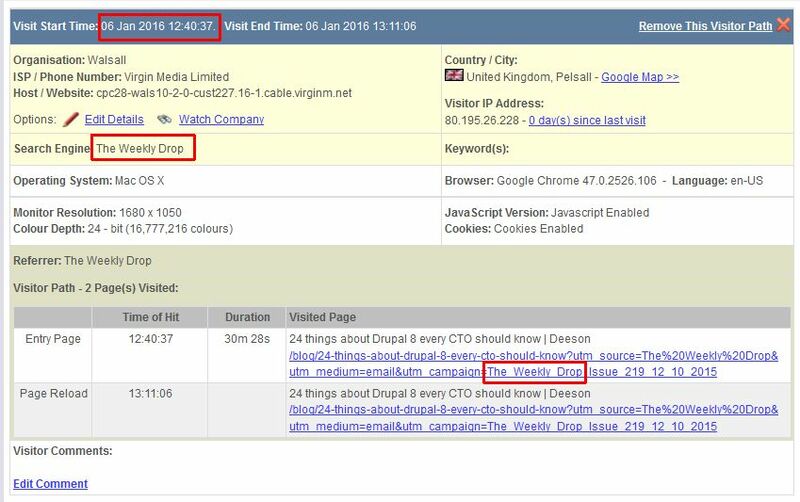 You can see that they came from the email campaign and at which date and time, but the A1WebStats system doesn’t have a record of that person linked to that IP address. What you now need to do is a bit of a manual process but when it’s done once for each email campaign recipient, it’ll apply for every time they access your emails from the same IP address. Look at the date and time of entry (as in the example above) and then match it up with the data from your email marketing system. This will give you the name/company of the person who clicked through from your email on that date and time. 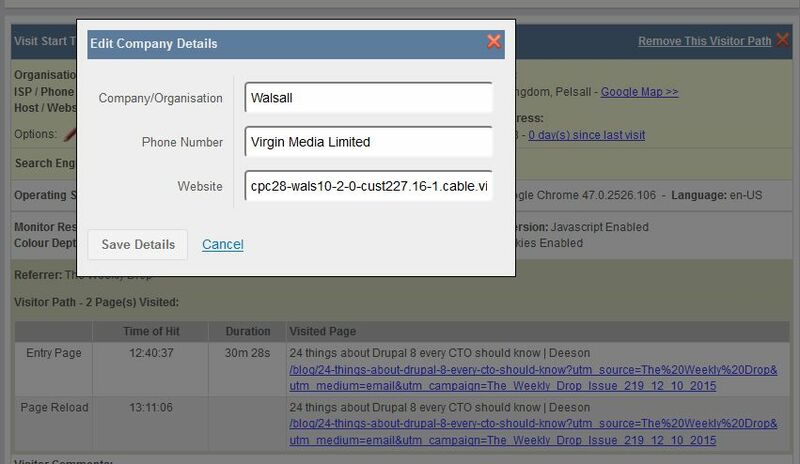 You can now edit the details within A1WebStats, changing the anonymous IP address data to what you now know was linked to the person who clicked through from your email campaign. You do this by first clicking on the ‘Edit Details’ link as shown below, which brings up a box showing the details that you can edit. Now you can change the Organisation name to whatever you want it to be. It could be the name of an individual person, an organisation name, or any other way you want to record it. You don’t have to add in the phone number or website address – that’s entirely your choice (but may be useful to you in the future). 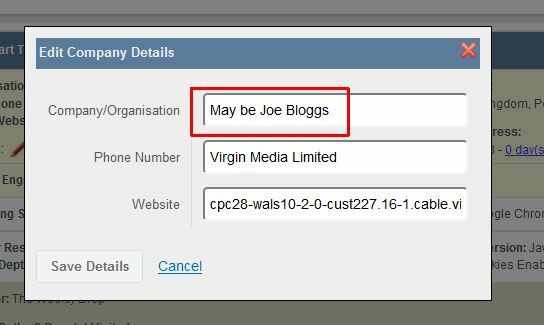 You’ll notice in the example below that we’ve used ‘May be Joe Bloggs’. This is because Joe Bloggs may not have clicked from their normal location and so, until we see Joe Bloggs repeatedly coming back to the website on that same IP address, we will keep it as ‘May be’. You can later edit the details and remove the ‘May be’ and it’ll update historically. We consider your data to be proprietary to you. If you made an error in linking an IP address to a company/person, we couldn’t have that going into our database. Although it takes time to link back each email clicker to the corresponding date and time of visit within the A1WebStats data, the task reduces over time and the end result is that you will see every time that visitor comes back to your website because they’ll be clearly identified in your Companies data. How to see which Google Adwords clicks go no further than the landing page.